Clinically, several groups of symptoms, both overlapping and distinct, are seen: neck and shoulder pain, suboccipital pain and headache, radicular symptoms, and cervical spondylotic myelopathy (CSM). The most common symptom is intermittent persistent neck and shoulder pain. The pain can be chronic or episodic, associated with long periods of remission. Neck pain is often accompanied by stiffness which progressively worsens. Pain may also radiate to the shoulders or to the occiput. Many patients present with interscapular pain, pain in the arm, forearm, and/or hand pain. Non-specific headaches occurring mostly in the sub-occipital region (the lower part at the back of the head) and this pain radiates to the base of the neck and to the vertex (top) of the head. Patients without any history of trauma present with pain, loss of sensation, abnormal sensations and weakness, or a combination of these symptoms. These symptoms are often present in the shoulders, arms and rarely in the legs. Occasionally, the pain may be atypical and present as chest pain or breast pain (false angina). Patients with myelopathy can present with symptoms such as difficulty in writing; nonspecific, diffuse weakness; and abnormal sensations. On examination: The patient shows limited ability to bend the head to sides/front/back and to rotate the head. The stiffness of neck is the predominant sign, found in many of the patients. 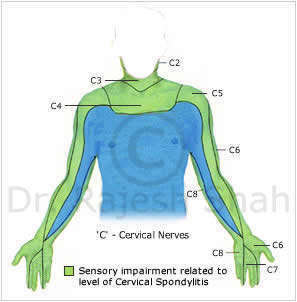 Weakness in muscles and altered sensations (in the affected areas as shown in the image above) are found in severe cases.